Some years ago, I earned my degree in video production. This should’ve been enough to land me a steady career in the fast food industry. But, as luck would have it, from time to time I snagged production jobs. I remember my first job perfectly clear. It was at a way, way off-market TV station. They had plenty of equipment that I could never afford. They had a Grass Valley switcher, dozens of 3/4-inch tape decks, audio mixers, and on and on. 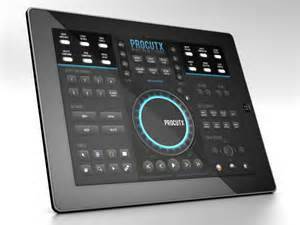 To me, one of the more intriguing pieces of software to enter the post-production field is PROCUTX™ . At first blush, this seems the ideal set-up. With Mavericks providing the built-in capability of sending my canvases to my 42″ HDTV, while keeping my timeline and bins on my MBA, this should make for a great set up to control the whole operation. PROCUTX™ gives users control over all the FCPX editing tools in one clean, streamlined interface, eliminating the need for clicking and searching through the Final Cut Pro X menus. The interface dial (jog wheel), centrally located on the screen, allows editors to scan their project’s timeline by dragging their finger around the wheel to move the playhead frame-by-frame. Menus have been replaced with buttons that allow editors to move forward or backwards to the edit points between their clips. With the Toolbox in the bottom left and main timeline dial, users can make all of their edits. 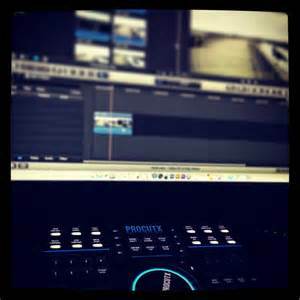 Editors can quickly select, cut, retime and trim their footage without ever touching the mouse or keyboard. The intuitive interface eliminates the need to click through tabs in the Final Cut Pro X Inspector to color correct images. You can control the Color Board’s exposure, saturation, and color using the directional pad in the bottom right corner of the screen. Plus, you can auto-correct a clip’s white balance, color and noise removal with designated auto-correction buttons on the right side of the PROCUTX™ interface. Using the Compound Clip controls, users can group a complex set of elements and collapse them into a single clip just by tapping the button in the top-left corner of the interface. They can then open or break them apart later with the designated buttons. Using the other designated buttons in the top-right of the application, users can take care of all of their importing, exporting and rendering needs. The interface allows users to accept and deliver files to and from Final Cut Pro X at the push of a button. The virtual aspect of this app is the very thing that will keep some editors from seriously considering it as a viable tool. A number of editors prefer the tactile feel of a jog knob. So, you can see that the choice is predominantly subjective. Also, an update to Mavericks is definitely in order. Or perhaps focus on creating a flawless update for 10.10. I like the workflow that this app helps me configure. As i said at the top, PROCUTX™ allows me to spread out all of my tools and leave them be, never having to move around various palettes, allowing me to focus on polishing my edits and to experiment with different ideas. It’s the kind of set up that I would dream of for years. Now, it’s happily a reality.